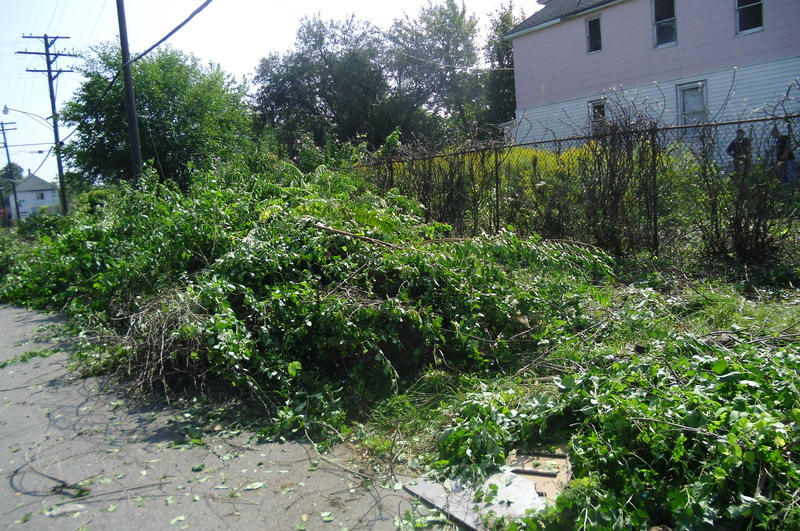 The originally thought was to mow a vacant lot, pick up debris, and board up a few vacant houses on a single block of Campbell Street. What ended up happening surprised us. It began when Detroit firefighters stationed in the area learned of a house being renovated by Nicole Curtis for her show Rehab Addict (which airs on HGTV and DIY Network). When you look at the area surrounding Nicole’s house you see a neighborhood that is still connected, still trying to hold on. Neighbors there know each other. 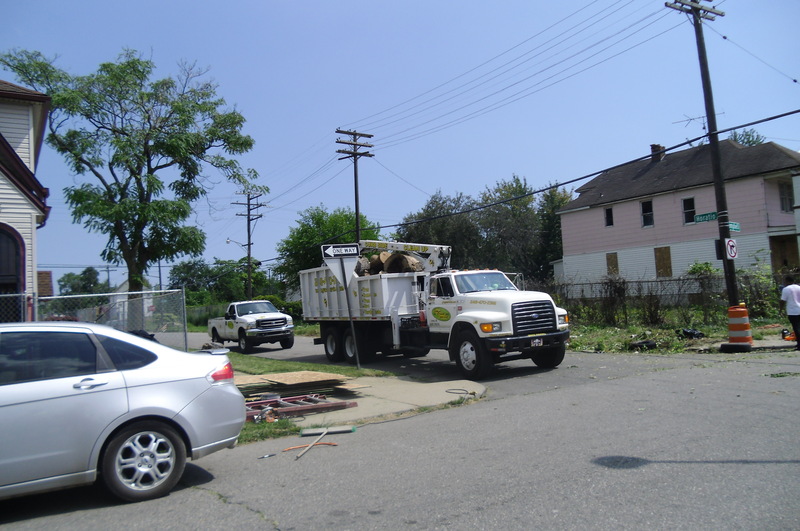 They do their best to keep grass mowed and debris out of vacant lots. This is a neighborhood that has not given up, a neighborhood that just needed a boost. 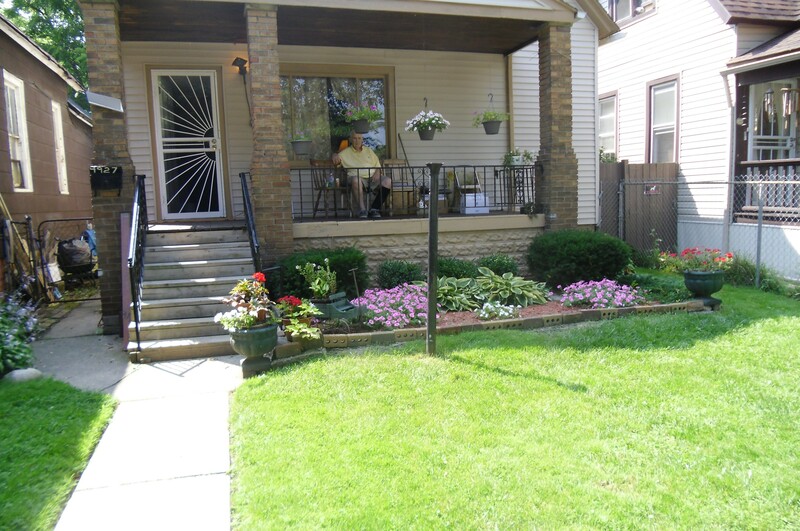 This is just one of the reasons we choose this neighborhood. Residents here are working hard to maintain a sense of community pride. Detroit Firemen’s Fund and DFDLegacy.com started spreading the word of the need for volunteers to help this southwest Detroit neighborhood. Help came in so many ways. Detroit and surrounding area firefighters, business that donated time and items, local media who helped highlight what items we needed, and most importantly, residents of the area came to help. One of the best parts of this project was seeing young people from the area get involved. Several local kids jumped in without prompting from adults. They grabbed a pair of work gloves and started hauling brush to dumpsters. Although I know the brush can get out of control, and grass can grow long again, I am confident that the positive impression made on these young people will not soon fade. We set out with the small goal of mowing a vacant lot and securing vacant houses on a single block, and together, we accomplished so much more than we had originally planned. Cut overgrown brush and trees from a corner lot making sidewalks useable again and improved visibility for vehicle traffic at the intersection. The true heros of this project are our volunteers. Without the hard work and sweat equity they gave, nothing could have been accomplished. Crews provided with specialized equipment from our donors. Home Depot @ 7mile & Meyers Detroit – provided wood for board ups, work gloves, screws, trash bags, etc. If the opportunity arises to support the companies that have supported us, we ask you to please do so. Their selfless dedication to community service makes them stand out amongst their competition. 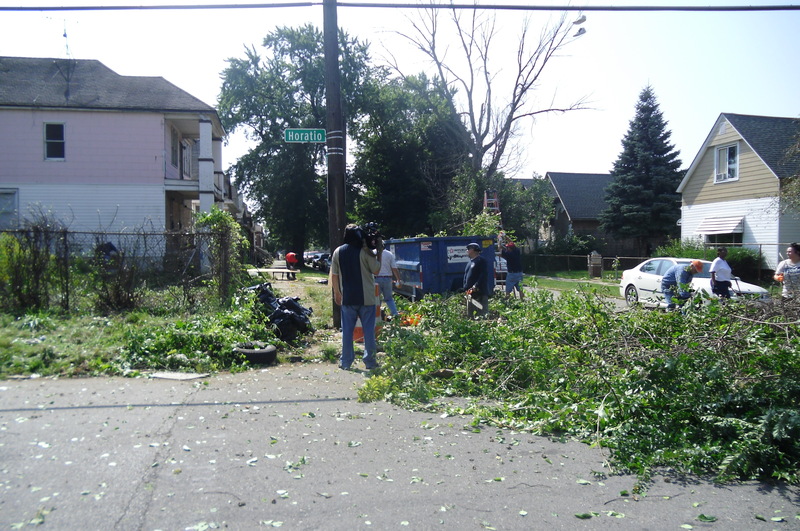 On our first day, Thursday, we tackled the yard and surrounding sidewalk of a vacant home at the corner of Horatio and Campbell. The view as we began clearing overgrown brush. There’s a sidewalk in there, somewhere. Brush and trees were so overgrown that the sidewalks were unusable. By the end of the day, a neighbor who lived on the opposite corned told me she was so grateful that for the first time in years she could look out her kitchen window and see down the next block to her relative’s home. Another lady who was driving by also thanked us. She said that she was always very worried at that intersection. Because of the brush, drivers could not see oncoming traffic. Look, there is a sidewalk there! Another area of focus was a lot where a neighbor had started a community garden. Huge logs, debris and overgrown grass prevented her from planting a bigger garden. 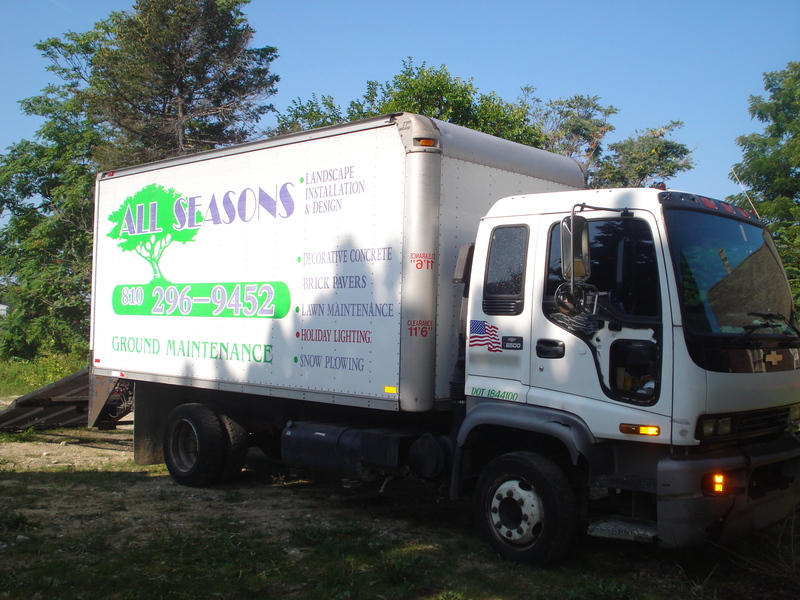 We were blessed to have Tom Grays from Grays Outdoor Services come with a grappling dump truck and a crew. They removed the logs and took them to a local artist that will use them to heat his pottery kiln. Then they returned for another load of debris. By the end of the day the garden area was looking good. Those were some really big logs. 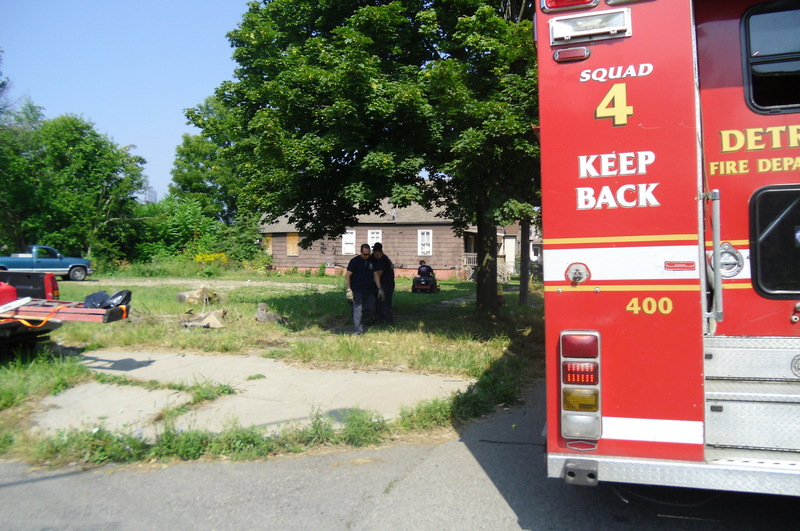 The crew of Squad 4 came and started cleaning and mowing another vacant lot. Part way through, they were called to a commercial building fire just a few blocks away. When they had recuperated after the fire, they returned to finish mowing the lot and the area surrounding the community garden. That day, we also started securing vacant homes in the area. 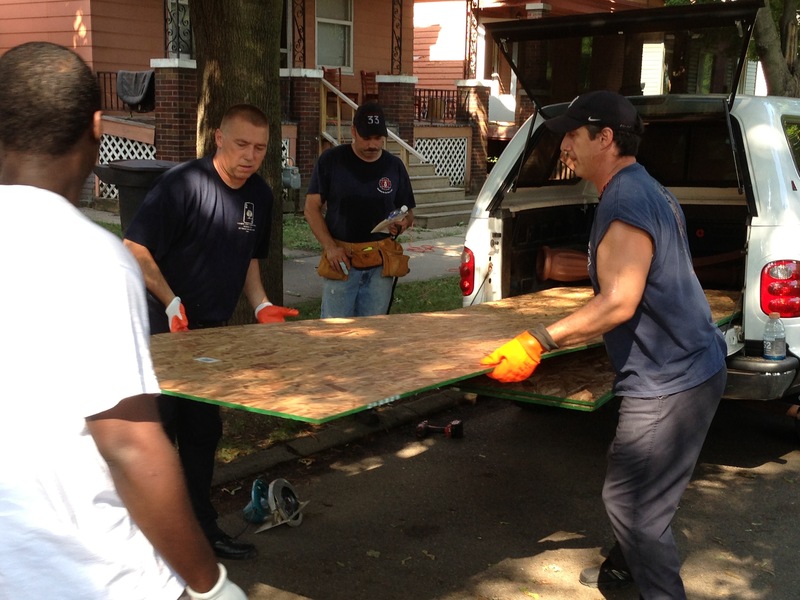 On day two, Friday, with many new and returning volunteers, we continued the boarding up of vacant homes. The board up crews worked so efficiently they finished the block we were focusing on and spread out to surrounding blocks. In total, 15 vacant properties were secured. A representative from Detroit Fire’s Community Relations Department paired up with a local resident and went door to door on the block installing smoke detectors. A crew from All Seasons Ground Maintenance edged the grass along the sidewalks of the entire neighborhood, then moved on to clean and mow another lot next to the community garden. After that they moved to a surrounding block to clean and mow another large vacant lot. In the midst of all the clean up, Detroit firefighter John Szarafinski and volunteer Brittnie Lomason reconstructed the brick work around the back porch of the house Nichole is rehabbing. Brittnie also came out on Thursday where she went to work picking up debris, and clearing brush, but it was Friday‘s brick project that really peaked her interest. Brittnie is an architect with a special interest in historic preservation of buildings. She recently moved back to Michigan from the Chicago area. A group of Wayne / Westland firefighters focused on further clean up of the corner lots at Horatio and Campbell. They told us it was important to them to support Detroit Fire given all the support they had received from Detroit in the wake of the loss of their brother, Firefighter Brian Woehlke. What a wonderful way to honor Brian’s memory and the brotherhood of firefighting. During the clean-up Nicole, the Rehab Addict had a bobcat available to assist with some of the heavy work. Unfortunately our bobcat drivers, Jeff Brinker from Fraser Fire injured his leg and had to go get stitches – 18 in total, but we are told he is doing well. That stopped some of the work we were hoping to get done, until Bill Gurski from Carleton Equipment Company came to pick up the bobcat. When we told Bill about what we were doing, instead of loading the equipment on the truck, he spent two hours he had not planned on clearing debris for us. We also had a mystery crew of volunteers. A group of tree trimmers (we did not get a company name) showed up and started cutting. If anyone knows who this crew was, please forward the information to us so we can properly thank them. As Friday was winding down we still had room in our dumpsters. 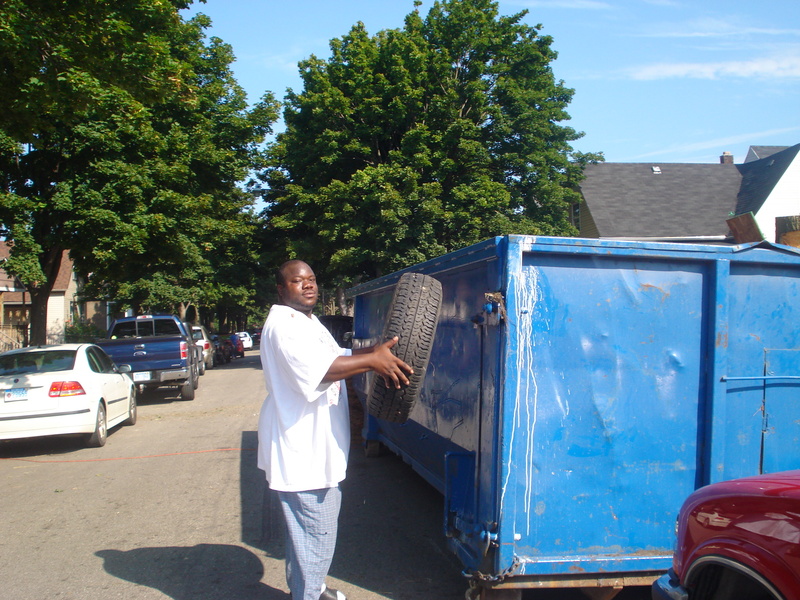 A group, consisting mainly of local residents, started expanding out into neighboring blocks with a pick-up truck and filling it large items that had been dumped. They came back with couches, dressers, mattresses, etc which quickly filled the remaining dumpster space. Chris helping to fill the dumpsters. On both days, some filming of the clean-up effort was done by the crew filming for Rehab Addict, Nicole’s show. They are projecting that episodes from Detroit will air in February. I will keep you posted as I learn more. We thank everyone involved in making this such a successful project. Without your assistance we could have never accomplished so much. Thanks to the following media outlets for airing our story which resulted in volunteers and many of the donations listed above. 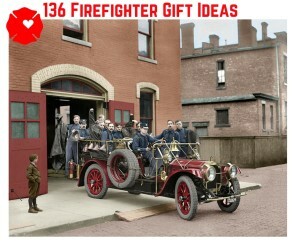 ©2019 Detroit Fire Department - DFDLegacy.com . Powered by the Get Noticed! Theme.